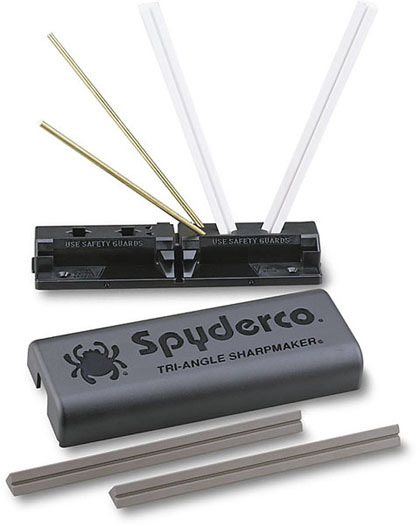 The Tri-Angle Sharpmaker (204MF) includes two sets of high alumina ceramic stones: A pair of medium-grit (brown) 7" x .5" (178mm x 13mm) stones for aggressive sharpening and a set of fine (white) 7" x .5" (178mm x 13mm) stones for professional grade finishing. The stones are triangular for sharpening Plainedges on the flat sides and SpyderEdges (serrations) on the corners. A furrow running the length of each stone lets you sharpen pointed items like fishhooks, darts and awls. Included is a set of brass safety rods protecting the users hands while sharpening. All components snap into the self-contained ABS plastic base and lid -- ready to travel with you. Die-cut into the base are keyed slots and holes fitted for the stones. They accurately set the stone's sharpening angle at a 30° (15° each side) or 40° (20° each side) for knives and a 12.5° scissor setting. Turn the base over, a channel lets you lay two stones side-by-side (flat-side up) for use as a benchstone. The lid snaps halfway over the base creating a handhold for stability while you're sharpening. Included is a set of brass safety rods to protect the users hands while sharpening. Ceramic stones, like glass, will break if dropped -- handle carefully. Use them dry, without oil, water or lubricants. To clean: scrub stones with a plastic scouring pad and powered abrasive cleaner, let air-dry. Also autoclave safe. System comes with instruction book and DVD.